Yes, this is me right now. Why? Because today I heard that Rocking Horse Hill has gone to reprint again. That’s a whole lot of lovely horsies galloping about. To say I’m thrilled to bits would be an understatement. I can’t thank everyone who has supported this book and spread the word enough. In the iconic words of Jeff Fenech, I love youse all! Rocking Horse Hill is currently featured in the latest BigW and K-Mart catalogues, available in all the ebook stores like Amazon, iBooks, Google Play, Kobo and JB HiFi, and from online retailers like Booktopia and Bookworld. Your local bookstore would also love to help you out with a copy. Speaking of ebooks, my previous releases are all currently discounted so if you haven’t read Promises, Heart of the Valley or Heartland yet, now is your chance to grab an ebook bargain. Hurry though, these special prices are for a limited time only. Last weekend I ventured up to Katoomba in the Blue Mountains for a booksigning at the new BigW store there. What a wonderful display the staff made, and everyone was really warm and welcoming. It’s such fun to get out and meet old and new readers. Speaking of meeting people, if you’re in western Sydney don’t miss A Romantic Morning with myself and Rachael Johns at Penrith Library, 10am Friday 9th May. We’ll be chatting about our inspirations and writing, and signing books. Tickets are free from the Penrith Library service desk. 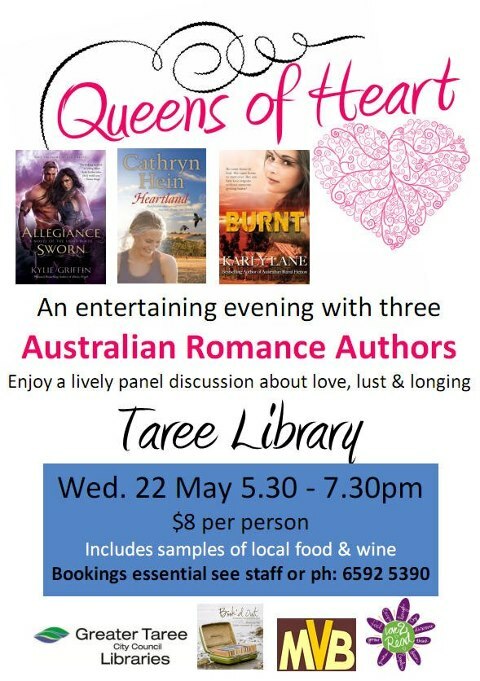 I’ve also just confirmed a date for an event at Hawkesbury Library. Join me for morning tea and a chat, 10-30am for an 11am start , Thursday 12th June at the Deerubbin Centre, Windsor. Keep your eye out for more events, including talks in western Victoria and the official book launch at Mount Gambier Library. This entry was posted in News, Rocking Horse Hill, This Writing Life and tagged Australian Authors, Australian fiction, Australian novels, Australian romance authors, Australian Writers, Author Events, Booktopia, Bookworld, Cathryn Hein, Cathryn Hein events, ebooks, Hawkesbury Library, Heart of the Valley, Heartland, Penrith Library, Promises, Rachael Johns, Rocking Horse Hill, rural fiction, Rural lit, rural romance, This writing life on April 30, 2014 by Cathryn Hein.